EnviroTech has been protecting local homes and families for over 20 years. 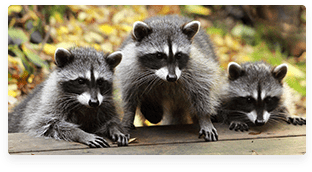 Our nuisance wildlife team provides a variety of humane procedures that effectively evict wildlife from your home permanently. As we take over animals’ natural habitats in favor of business and home development, we leave wildlife no option but to invade our spaces. Experts say that natural wildlife numbers continue to rise every year due to plentiful food sources and moderate weather patterns. Your home or business is built to keep you sheltered from the elements and warm in the winter. Why wouldn’t wildlife want the same for them and their families? Animals have habits just like humans. Our experts educate our customers on those specific circumstances. Since all animals are different, we bring you up to speed on the specific animals you are dealing with and the dangers associated with them. Knowing what you’re up against is the key to successful wildlife control. EnviroTech policy is to physically remove the animal as humanely as possible without harm. In most cases, we work to arrange a one-way exit, allowing animals to retreat safely to the harboring area and preventing a means of return. If babies or pups are present, we create an opportunity for them to exit and relocate with the mother. After the animal has been evicted, we will identify and secure entry points, cracks, holes, wires, beams – anything an animal can use to enter the structure. We make sure that your house really is 100% nuisance wildlife-proof. It’s our guarantee! Our trained staff will perform a thorough clean-up and sanitization to ensure the animal’s harborage area and feces are properly treated. This ensures safe living conditions for you and your family. What You’ll Hear: Listen for scuffling in the walls/ceilings. Animal sounds such as chirps, squeaks, etc, likely indicate a problem. What You’ll See: Look for signs of animals that may be harboring nearby, such as droppings. 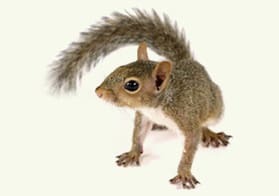 Common nuisance wildlife includes squirrels, opossums, skunks, raccoons, bats, mice, birds, chipmunks, and more.